Micah Heakin runs the video rental store "Mo Heakin Video" in Eek, Alaska. 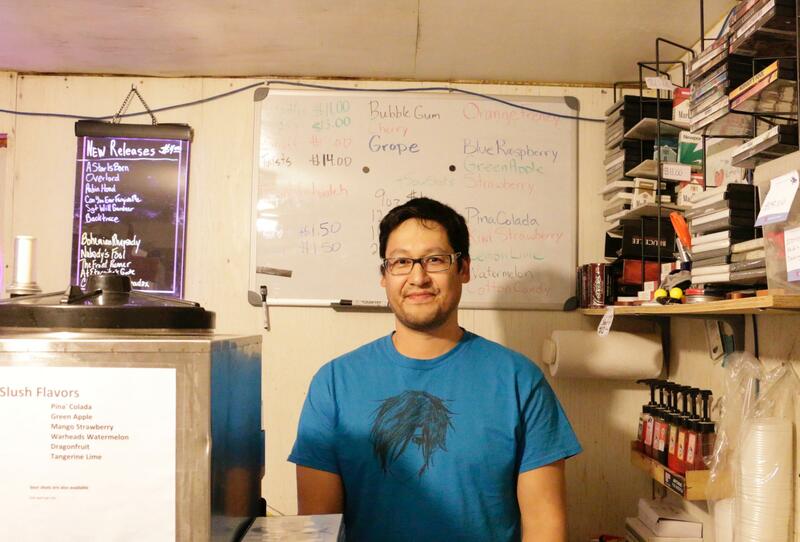 Small businesses are rare in villages across the Yukon-Kuskokwim Delta. Often the village corporation store is the only place in town to shop. But in Eek, customers have another place to go for a sweet treat, a movie, or tobacco. In the window of a white house in Eek, a neon sign flashes the word “Open.” Through the door thrums the driving beat of Queen’s 1977 hit “We Will Rock You.” Inside, Micah Heakin is pouring gallons of water into a slushie machine and rocking out. He’s been on a Queen music kick after watching the hit movie about the band, "Bohemian Rhapsody." “I’ve always been a Queen fan,” he says, turning down the music. But he hasn’t been able to watch the film in a while. Heakin owns a DVD rental store in his hometown of Eek, and "Bohemian Rhapsody" has been a popular sell lately, which is unusual. It’s not what his customers typically go for. The store is a single room, 16 by 12 feet, attached to Heakin’s house. He started renting movies in the late 1990s. At that time they were VHS and took up more space. Now, thousands of DVDs line the walls from floor to ceiling. Heakin’s store also sells tobacco products, candy, and slushies in more than a dozen flavors. Everyone has their favorite. “My daughter’s is mango-strawberry, and my son likes to mix bubblegum with watermelon,” Heakin said. Everyone in town knows his store. It’s the place I was told to go in the evening while in Eek. One day Heakin’s wife, who works at the Eek School, told him about watching kindergarteners draw maps of the village. “They’d have their house, the post office, the school, and Micah’s store,” he remembered, laughing. That’s what people call the shop: “Micah’s Store.” Its official name is “Mo Heakin Video,” after Heakin’s nickname in college, but that name only seems to appear on offical documents and a small wooden sign hung in a corner of the shop. Heakin runs his store for about five hours every evening after his full-time job managing the Eek Tribal Council Gaming Department. It makes for long days, but for Heakin, it’s a good way to spend an evening. Heakin says that there’s room for more shops like his. Eek’s population is growing, and that means businesses can too.